Belt Loop Bait Bags are very convenient as they snap on and off your pants belt loops. You can place them anywhere that works for you while training. Sometimes I train with the bag on my side and other times I want the treats to be hidden so I snap the bag to my pants back belt loops. You can wear multiply bait bags at the same time one may hold the treats and the other a ball reward. They are double layer construction. The interior is made from a water resistant vinyl so very easy to wash out the Belt Loop Bait Bags, making clean up a snap. The exterior is made of sturdy weight durable Cordura. The two swivel snaps are attached with elastic webbing giving the bag room to adjust while attaching to your belt loop. The large bag has Velcro inside the top edge so the bag can be closed if desired. 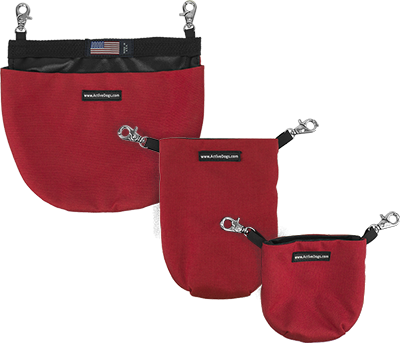 These Belt Loop Bait Bags come in three sizes. Size Large 10” x 9”, Small 8” x 6”, and the Mini Bag is 5.5” x 5.5”. I personally use all of them for different type of reward training but most commonly tend to grab the size small because it is deep and I can also store my phone in it when not using it as a food reward bag. There are two colors to choose from red or black. MADE IN USA. Purchase separately or in a set of all three bags for a discounted price.